Accessory Tensioner - Clutch Bearings Industries Co., Ltd. Clutch bearings is a professional accessory tensioner manufacturer of automobile accessories includes wheel bearing hub, alternator pulley, and etc. The item is wide used in the transmission system. As the media between the power transit structures, choosing proper accessory tensioner does affect the performance directly. For different occasions, Clutch provides the item with more than 300 items to choose. Most time you can find it easily from us. If you need a unique dimension not in our list, Clutch also accepts customized orders. Strict quality control of each accessory tensioner is what Clutch always cares. We believe only the product with excellent quality can make the performance with best efficiency. Any question or further information, please don't be hesitated to contact Clutch. 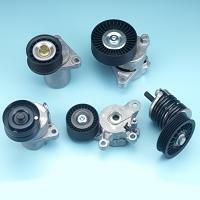 * More than 300 items of accessory automatic tensioner options. * Having more than 10 years experience to develop automatic tensioners.